THIS IS THE SOUGHT AFTER FULL ADULT SIZE USA SONNETT LIGHTNING MODEL WITH THE BAT WEB. MADE IN THE USA IN 1964. MINT CONDITION NEVER USED. ALSO HAS THE DISTRIBUTER PRICE GUIDE. THE SONNETT CATALOG AND ORDER FORM ARE MINT. This glove has seen better days. But it's still really cool for a vintage glove. It's a bill tunnel model. Does have issues please see photos for damage. Shipped with USPS Priority Mail. Neat old glove, needs some love. Get a rare mitt for a bargain! We're always on the lookout for rare, unusual, and just plain useful things. We will ALWAYS go the extra mile to make sure you feel like you have received FIVE-STAR service. Awesome estate find. Check out the pics and buy with confidence! Thanks for looking! There is a stain in the palm, not sure what it is. Pro designed, trap action, nylon stitched, perma\-wear, deep cup pocket. Made in USA. See pictures for condition. UP FOR SALE. FEATURES PATENT PENDING LEATHER STRAP SUPPORT SYSTEM ON BACKSIDE OF WEBB DESIGN (SEE PICS). MADE IN USA! Perma set, deep cup pocket, pro designed, nylon stiches, made in USA. Visible pen markings, stitches off. Check pictures for condition. SONNETT CIRCA LATE 1950'S BASEBALL GLOVE. CATCHER'S MITT. SIZE 11 1/2". THIS IS A BIG LEAGUE GLOVE, NOT A LITTLE LEAGUE GLOVE. MADE IN THE USA. GLOVE FITS ON LEFT HAND AND THROWS WITH RIGHT HAND. 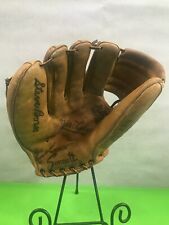 Vintage Sonnett U.S.A. Orlando Cepeda Model Baseball Glove RHT Model 6348. ****This glove doesn't look great but it is well broken in and very comfortable to wear. If the fingers were relaced I would not hesitate to use it to play catch as it is a VERY comfortable fit and opens and closes VERY smoothly. Definitely looks worn/Vintage but still a nice piece. **** Please see pictures before buying. Glove is in rough condition. Thanks! This is a decent glove--leather is thick but dry as is lacing, lining smooth.